Cave drawings are more often thought of as the domain of France, but there are incredible petroglyphs in North America, too, dating back to 2000 BC. 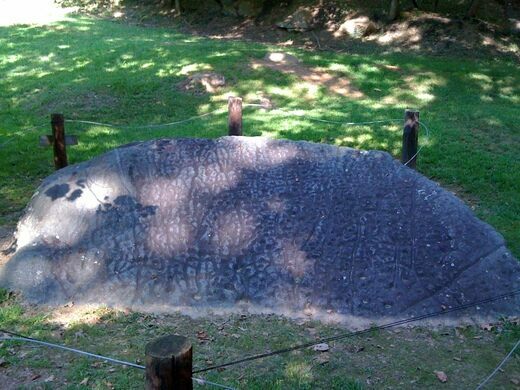 The Judaculla Rock was a sacred site for the Cherokee Indians before the colonization of North America, and this engraved soapstone boulder can still be visited in western North Carolina. The Cherokees believed Juaculla (or Tsul’Kalu) an ancient giant-like creature, landed on the rock while jumping from one mountain to another, and thus the rock bears his seven-fingered hand print. There is lingering folklore about ghost sounds being heard around the rock at night, made spookier by the location of a cemetery a few hundred feet away. Two other engraved rocks are said to be in the area: one was buried in a mining accident and the other, perhaps, is also buried. Dominated by mining the mineral-rich mountains, the area has never been fully excavated. In a limited dig, archeologists found quarry tools near-by and have speculated that the soapstone rock could have been engraved around the time that soapstone bowls are dated too, either between 3000-2000 BC or around 200 BC. Currently the rock is quickly eroding and evades study. There are several signs depicting the myth, history, etc about the rock itself and the Cherokee peoples. The rock was donated to Jackson County, and they are taking steps to prevent erosion and preserve the rock for viewing. It is open during day light hours. From US 74, take Exit 85 to Business Route 23 through Sylva. Stay on 23 1.3 miles to NC 107, then turn left onto 107. Drive 8 miles south on 107 and take a left onto Caney Fork Road, County Road 1737. Go 2.5 miles then turn left onto a gravel road and drive 0.45 mile. The rock is on the right, and parking is on the left.There are no restrooms, water fountains, or other such amenities. Youll only find the rock and a wooden viewing platform. Please do not sit on the rock, as any such contact will only increase the rate of erosion.